When you need a break from city life, head to the country! Specifically, head to the Timmermann House Bed & Breakfast in Aviston, Illinois, and enjoy a little luxurious rural relaxation. Located in southwestern Illinois, just 45 minutes from St. Louis, Missouri, the Timmermann House offers wide-open vistas with glorious sunsets and warm hospitality, courtesy of innkeeper Sandy Timmermann. The current Inn is nearly double the size of the original 1940’s farmhouse, thanks to additions and upgrades over the years. One of the add-ons is a lovely large and inviting deck overlooking the B&B’s award-winning flower garden. Settle into one of the easy chairs—it’s the ideal spot for sipping morning coffee or lingering in the evenings. Weather permitting, you can enjoy delicious breakfasts out here too. The B&B has a spacious living room with lots of comfortable seating and a fireplace for cool evenings. You’ll find delightful personal touches throughout the B&B, including an original mural on the lower level that was painted by Sandy’s mother. Each of the two guest rooms has a private bath and pampering luxuries, such as quality Comphy sheets, plush robes, Turkish towels, and flat screen TV’s with DVD players. Guests will find homemade cookies on the kitchen counter, and enjoy full course gourmet breakfasts featuring fresh ingredients from the B&B’s own gardens. 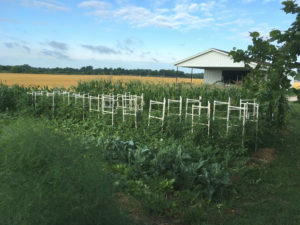 Beginning in April, the Timmermann House takes advantage of its bountiful garden and hosts a farmers market, offering everything from fresh asparagus and strawberries in spring to pumpkins in the fall. So not only can you stay and relax, you can also bring home some of the Inn’s goodness with you! Timmermann House Bed & Breakfast is a member of the Illinois Bed and Breakfast Association … a unique lodging experience! 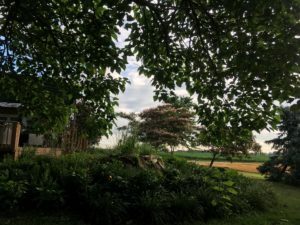 This entry was posted in Food and wine, Illinois Bed and Breakfasts, Touring Illinois and tagged Illinois Bed & Breakfasts by admin. Bookmark the permalink.